As a special contributor to the Dallas Morning News, Michael Hiller recaps his recent Kimberley adventure-cruise aboard the TRUE NORTH. 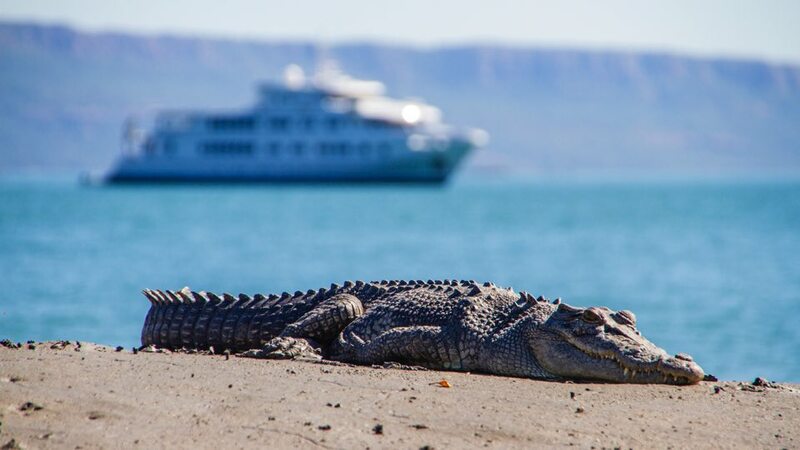 You don't book a True North Adventure Cruise through Australia's remote Kimberley region to spend the day in a spa or lounge by the pool. You come to be wowed. You come to hike up rust-stained cliffs, fish for barramundi deep inside mangrove forests and swim in billabongs (freshwater pools) fed by waterfalls. There's no tiptoeing around it. 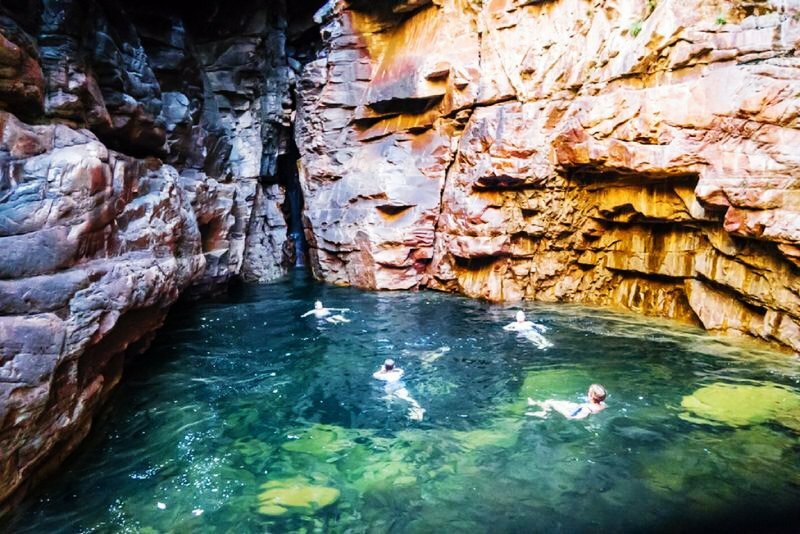 Australia's northwest Kimberley is off the beaten path, way off: 2,000 miles from Sydney and three hours by air from Darwin, the closest major airport. And that's after a 17-hour Dallas-to-Sydney nonstop flight, among the two longest commercial flights in the world. If you think you've seen Australia because you've been to Sydney and Melbourne, think again. The Kimberley is one-sixth of Australia's land mass and roughly the size of California. But the region hides most of its beauty along its rugged coastline, which means it's best experienced from the sea. The attraction here is the wilderness: untamed, unspoiled and uninhabited. A collision of land and sea comprising 2,600 islands, 34 rivers, emerald palms, biscuit-tinted sand and orange cliffs whose visible strata tick back almost 2 billion years. 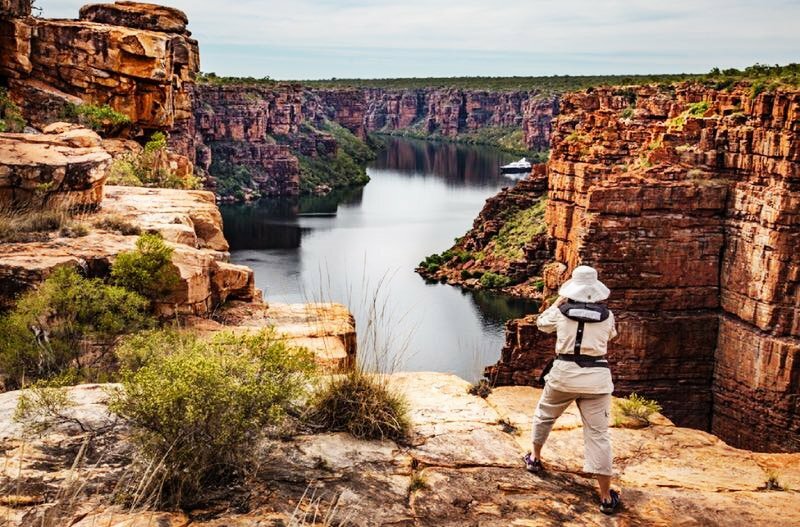 "Even though you don't see the kangaroos and wallabies that most Americans expect to see, the Kimberley is the real Outback. It's Crocodile Dundee country," says Justin Rizzari, a marine biologist from Galveston who leads wilderness excursions on True North Adventure Cruises' True North, a purpose-built expedition ship designed to ply these waters. "These waters are mostly uncharted," says our captain. "There are essentially no maps. You have to know the land, the tides, and their mood because they change every day." Because the True North has a shallow draft of just 7 feet, the ship can shimmy into nooks that large ships avoid, nosing right into the waterfalls at Kings Cascade to drench passengers under the crystalline waters, cruising beside crocodiles in the Mitchell River, and tucking into a mangrove forest where guests set traps for sand crabs. To sneak into fishing holes, stalk crocodiles and access even more remote locations, six dedicated expedition boats helmed by experienced guides launch off True North's rear deck. And to take in something utterly spectacular like the Horizontal Falls, where a massive tide sweeps between two narrow gorges and lifts the water more than 30 feet, or Montgomery Reef, where hundreds of square miles of land appear to rise from the ocean as the tide quickly falls, guests can hop aboard the True North's seven-passenger helicopter. The ship carries just 36 guests and 20 crew members (including specialist guides and naturalists) in style. Bright, modern cabins, spacious lounge areas, sundecks, an al fresco bar, and an all-Aussie crew who deliver indulgent service are hallmark qualities. Two talented chefs cook primarily locally sourced food, which means you might dine on barramundi caught earlier that day, queenfish sashimi during cocktail hour or crabs steamed on the beach at sunset. Except for an occasional yacht, we rarely saw another ship -- or any humans -- during our seven-day voyage tracing the coast from Broome to Darwin and hopscotching between such Kimberley must-sees as Montgomery Reef, King George Falls, Prince Regent River and Horizontal Falls. But from the ship and while exploring the land on foot, we spotted plenty of indigenous wildlife, including saltwater crocodiles, white-bellied sea eagles, red-headed honey eaters, manta rays, 2-foot lizards, hammerhead sharks, bottlenose dolphins and a mudskipper, a fish that can walk on land. "It's the only cruise I've been on that everybody does almost everything," Sue Clarkson said. "You don't come here to sleep in." Early one day, we hiked 300 feet up a red sandstone rock path to view thousand-year-old Aboriginal cave paintings, our path marked by centuries-old boab trees, gnarly vines and school-bus-size boulders. At the top, though, oh, what a sight: crocodiles and human faces etched on the ceiling in reds and whites and ochres, plus a splendid view of the river below. Another morning, we set out in the small expedition boats to trap mud crabs. My boat's haul for two hours: 16 crabs, one hammerhead shark and two empty traps raided by crocs we never spied. "Think there are any crocs here now?" I asked Kier, our sturdy, sandy-haired guide. "Absolutely. They've definitely been watching us, waiting for us to pull up lunch. That's why I carry this wooden bat," he answered. Two white herons circled over our heads, and something rustled in the brush. "Once, two years ago. A big croc snapped at the trap. I hit him over the head and he slinked away. You'd think he'd learned his lesson, but I've seen him again. That's why you never reach your hand over the side of the boat like you're doing now." "I can visit Sydney and Melbourne and Perth anytime," cruise guest Peter Harley said. 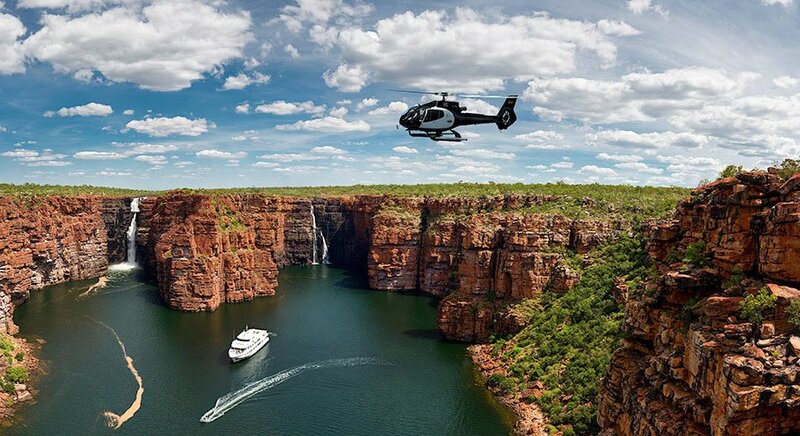 "But the Kimberley is an unspoiled wilderness that may not always stay that way. It's like America's Grand Canyon. Here, I've seen Aboriginal art and waterfalls and natural wonders that only hundred or maybe a few thousand people have seen, not millions. This is truly wilderness, and the staff knows how to make it come alive." "We really had to stretch our savings to come on this trip, but it was absolutely worth it," said Walter Cantatore, who was traveling with his wife, Stella. "And I'd do it again. To us Australians, experiencing this place from the ocean is truly special because so few of us get to see it and even fewer get to feel it this intimately." That's a sentiment echoed even by a flight attendant who sees the world while tending to the lie-flat crowd in business class: "The only job I'd trade for is one on the True North. What Australian doesn't dream of exploring the Kimberley from the ocean?" Itineraries are from May until late August; trips should be booked at least six months in advance. From about $9,900 per person, includes all meals and all excursions except helicopter tours.